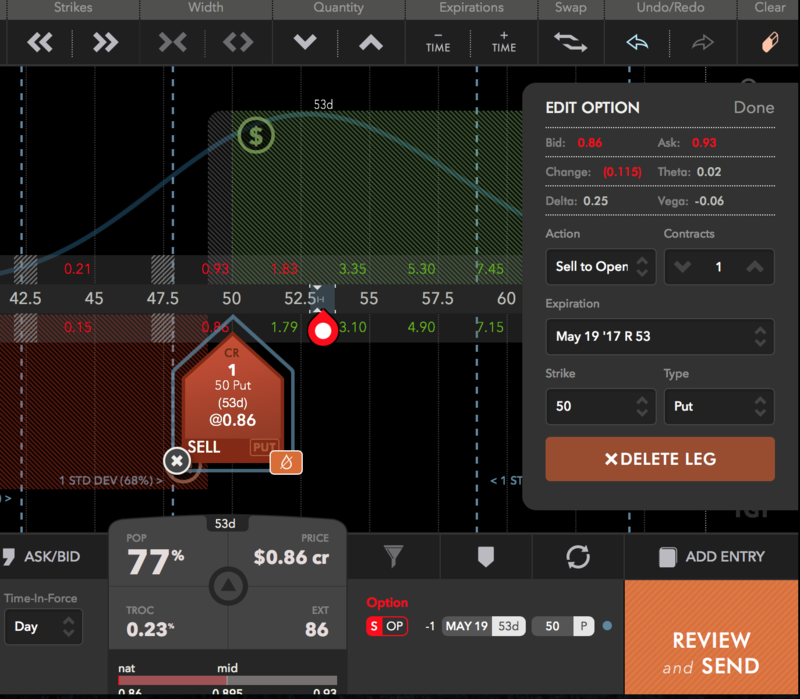 Recently tastytrade released a new options platform called tastyworks. Here are some of the details regarding commissions. Its pricing structure is excellent! The platform itself is super easy to use as well. It is very similar to the dough platform. 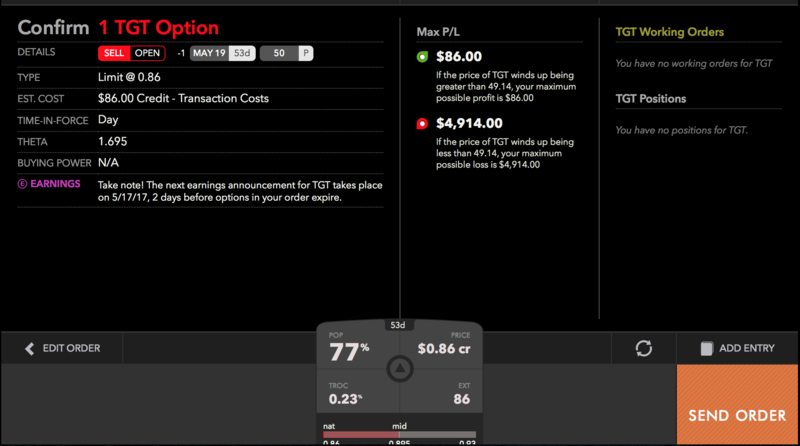 I’m in process of transferring some money over there, but in the meantime I actually use the tastyworks interface to review premiums when I am selling options on any other platform…it is that easy to use. Visit the site to see more details. This is the opening trading page. I tend to like the “curve” view but a more standard options table is also available. The red arrow show where you type the ticker symbol and it also gives information such as upcoming earnings. The green arrow shows implied volatility. I then clicked on the “Strategies” tab. This shows all the available trading strategies though you can also add to these and create your own. I chose Option (green circle) and then Short Put. The advanced settings lets you choose things such as your targeted days to expiration and percent out of the money. 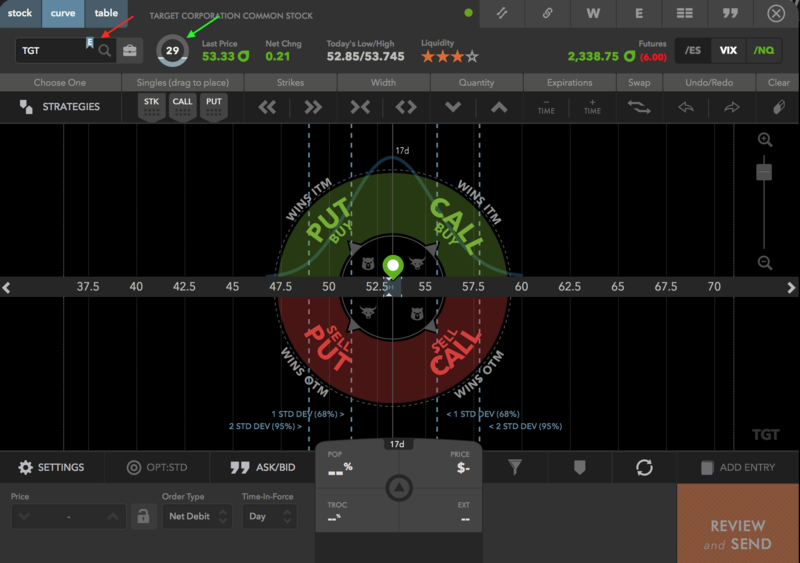 This shows what one of my typical put options looks like. At a glance you can see where you are profitable and where your losses occur. It also shows your probability of profit and return on capital. When you click on “Review and Send” you’ll get to this page which shows potential profit and loss and any commission costs. If you guy are interested in this platform please visit the tastyworks site directly to learn more information. For full disclosure, tastyworks did just start a referral program and I have included my referral code on the links to their site. Looks pretty slick. I’ll have to try this out. Thanks for sharing. I just opened my Roth IRA that I’m funding for 2016 with TW. I’ve been listening to their podcasts and they have so much great content. I’ve been wanting to try out the platform but wasn’t going to be able to squeeze out some extra cash for a taxable account, but once I saw we could open a Roth IRA for 2016 I’m all on board with TW. It’ll be interesting to see how things go since I’m going to use the account primarily for options trading which I’ve really been enjoying. I’m going to see if I can’t get on your referral since I just opened the account today. Yeah, TW is pretty cool. Great commissions! Thanks for trying my referral. 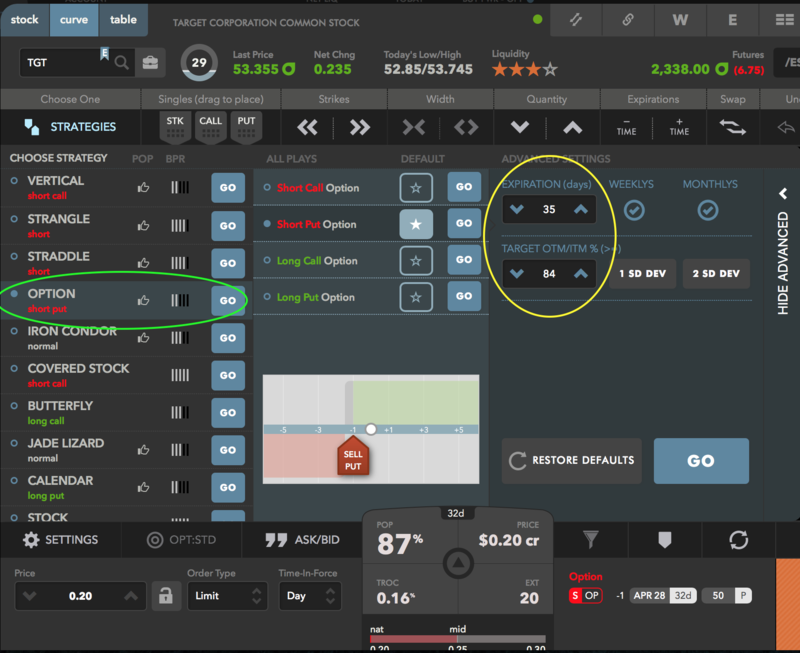 Go to https://manage.tastyworks.com and in the “did someone refer you” section type in JVA6NC2DZK. Thanks a lot! Let me know how you like it! I’ve truly never implemented this technique, appreciate your conveying it. Thanks, John K. I’m surprised that you aren’t familiar with options given that you are letting us know about your binary options site (which I’ve removed your links too). Why all the sudden spam posts about binary options? I’ve gotten about 5 or more that have gotten past my spam filters. Do you have paper trades? Hi Walter. No, tastyworks does not yet have paper trades. However, there are quite a few free paper trading sites and software that you can use. Several of these are listed on my PaperTrading Resources page.